Welcome to the Divine Diva Inspiration Challenge! Today our picture comes from The Perfect Remedy. Since this is also a release day for ISC, I have two projects to show. I’m using all ISC images for both, so combining the posts works out really well. For my first one, I’m using Marvels of Nature III for the tree and greeting images, and Christmas Trinkets for the building and background image. Out of the box is one of my fave techniques and I’m really enjoying the reverse (sort of into the box) of it. The principal is the same it’s just what you cut that is different. 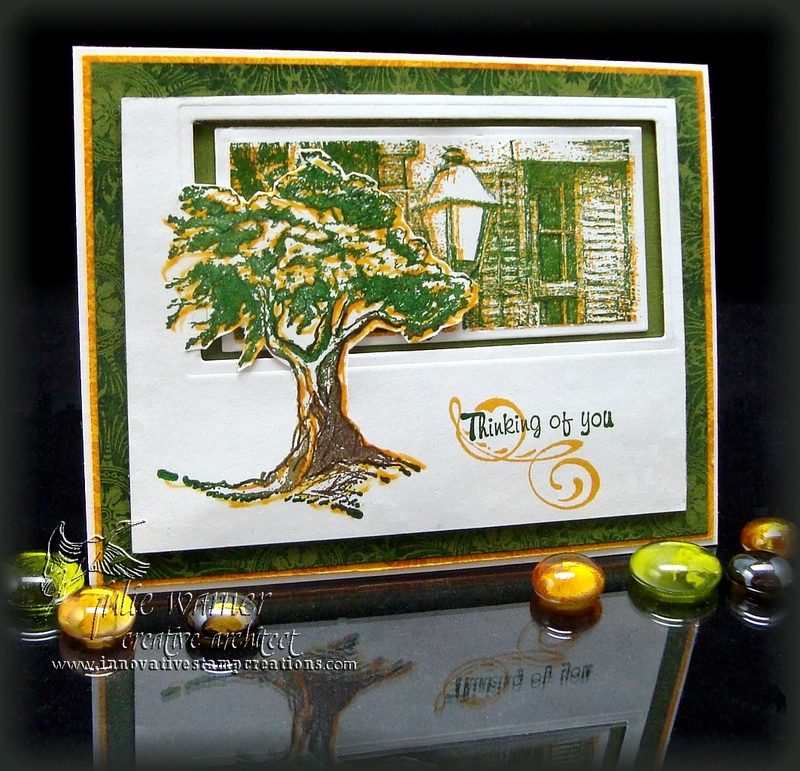 For this, I first stamped the tree with the green and brown inks and added highlights with a marker. I traced the Spellbinders long rectangle around the tree and cut around the part of the tree that was inside the rectangle. Then I cut the rectangle the same way I do in the out of the box method. 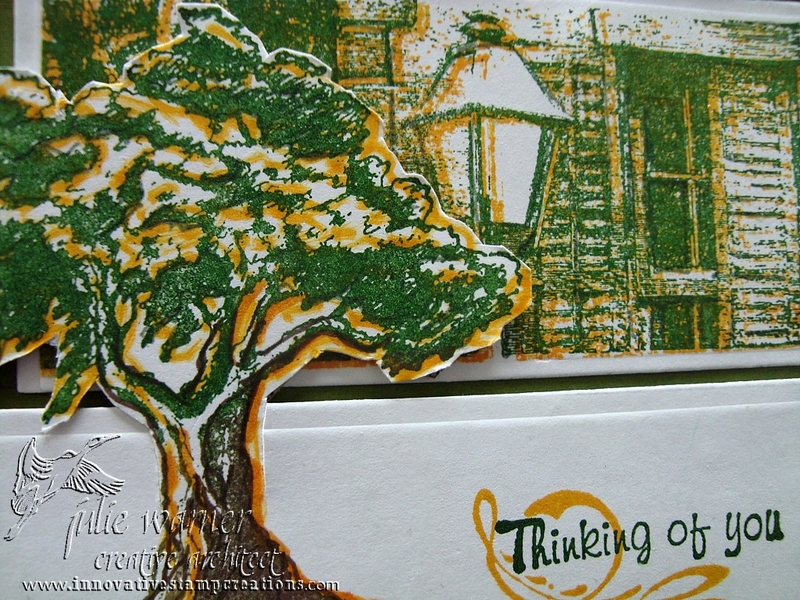 The building image was stamped first with green ink, then overstamped with the honey ink. I used a smaller rectangle to die cut it. 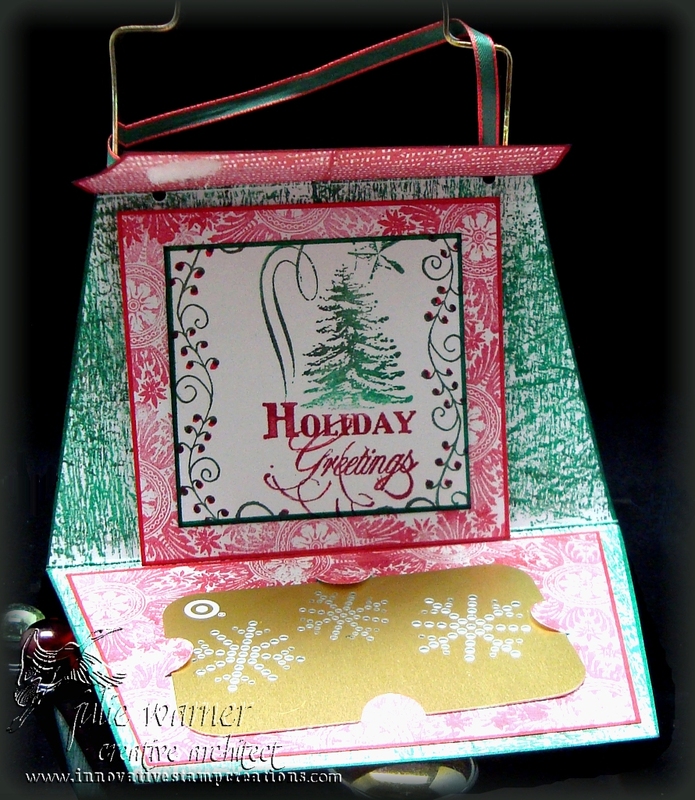 The green background was stamped with a medallion image from the Christmas set. Finished card measures 5.5 x 4.25. Please be sure to stop by and visit the rest of the Diva team. I know they’ll have some wonderful creations for you! Julie (justwritedesigns) you are here! 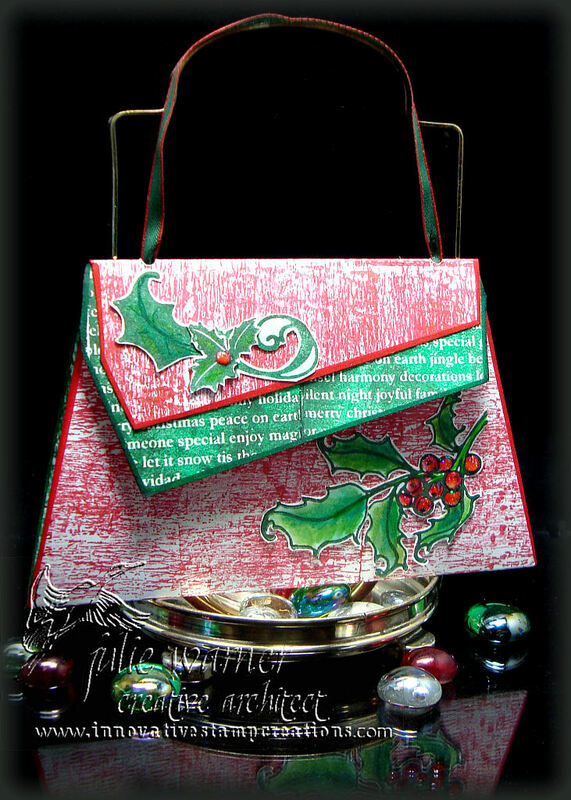 For the outside of my purse/holder, I stamped it with a distressed background image and a combo of the red inks. The flap liner was stamped with a combo of the green ink. Both were edged w/ markers. The holly images were colored w/ makers and cut out. I used a small Velcro circle (cut in half) for the closure. I used all of the pattern pieces except for the side gussets. These were left out in order for the purse to open completely. The gift card holder insert was attached to the bottom section but could just as easily be attached to the top. I used a Basic Grey notch tool to cut the half circle tabs but you could easily cut these w/ a kraft knife or use a slot punch. The small card with the greeting is not attached as you can see in the picture below. 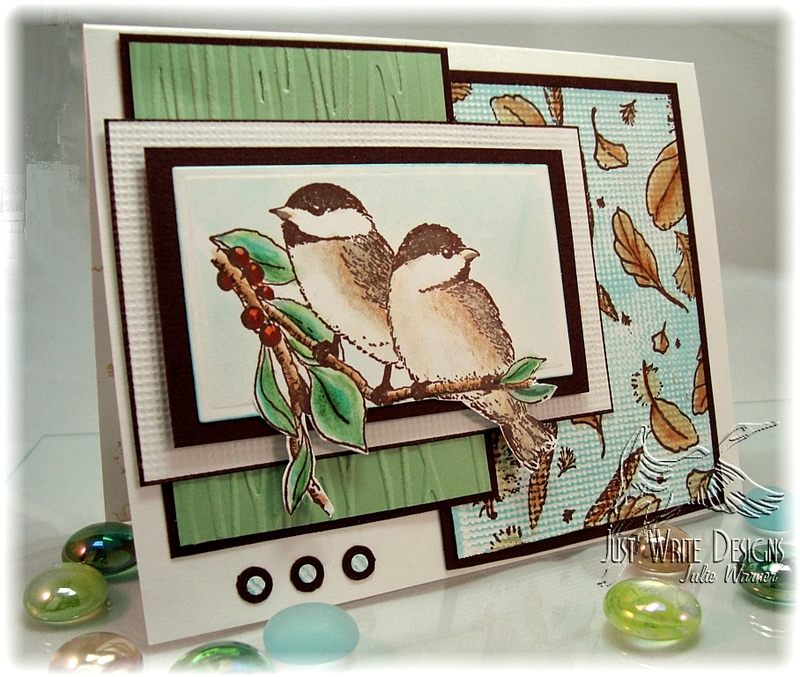 Time for another Divine Diva Inspiration Challenge! 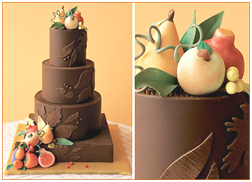 Today our picture comes from Hostessblog.com We had several but I chose this towering chocolate work of art. I like the look of the autumn colored fruit against all the chocolate. Yummy! All images are Innovative Stamp Creations. 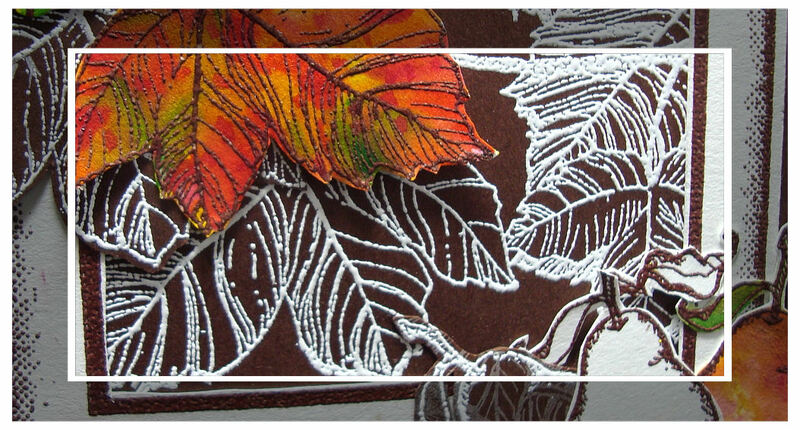 For my card, I white embossed the leaf background on dk chocolate card stock. I did the same with the sentiment, and extra leaf and one of the pears. 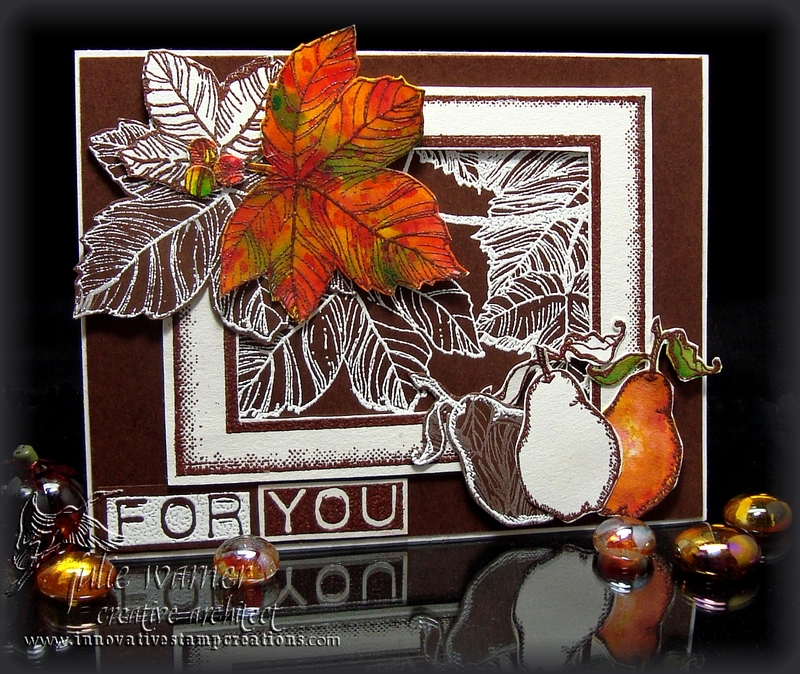 I used chocolate brown embossing powder on the big leaf, two more pears and the sentiment, again. I pieced together the sentiment from the two different colors. For the big leaf and one pear, I used dye reinkers and a water brush to color them. The final card measures 5.5 x 4.25. Please stop by and visit all of the Diva team, I know they’ll have some yummy creations for you! Thanks for stopping by! We’d love for you to join our challenge. Please put DDIC in your keywords. It’s time again for our Divine Divas Inspiration Challenge! This week, Lori chose some beautiful plates from Acacia. 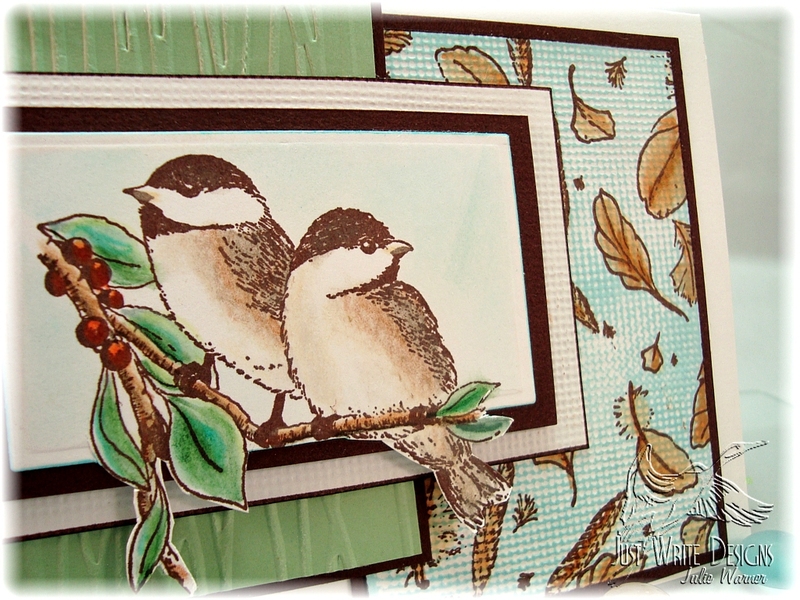 I love birds and I knew I had just the right chickadees image from Sparkle N Sprinkle. I stamped them with the chocolate ink and colored them with Prismacolor pencils. I used the Out of the Box Nestie technique (tutorial HERE) to cut them out, but I used a nesting rectangle set from Quickutz. Masking the birds, I sponged on a little of the Neptune ink. After matting on a chocolate brown layer, I tried something a little different on the white layer. Recently, I tried embossing card stock using a piece of plastic canvas. I liked it so I tried it with a piece of finer mesh vinyl (sold for cross stitch bookmarks). First I lightly misted a piece of white card stock, placed it on the Spellbinders tan embossing mat, placed the vinyl mesh on top and ran it through my Sizzix. I love how it turned out! It looks and feels just like artist canvas. I left the small piece white but on another, I brayered over it with the Neptune ink, stamped my feathers background (Anita’s/Sugarloaf) w/ the chocolate ink and colored them in w/ markers. The green bg was done w/ the forest branches Cuttlebug folder. I added some punched out circles as faux brads. Thanks so much for looking and please visit the rest of the Divine Diva Team. We would really love for y’all to play along in our challenge. Lori is offering some terrific blog candy for this challenge.